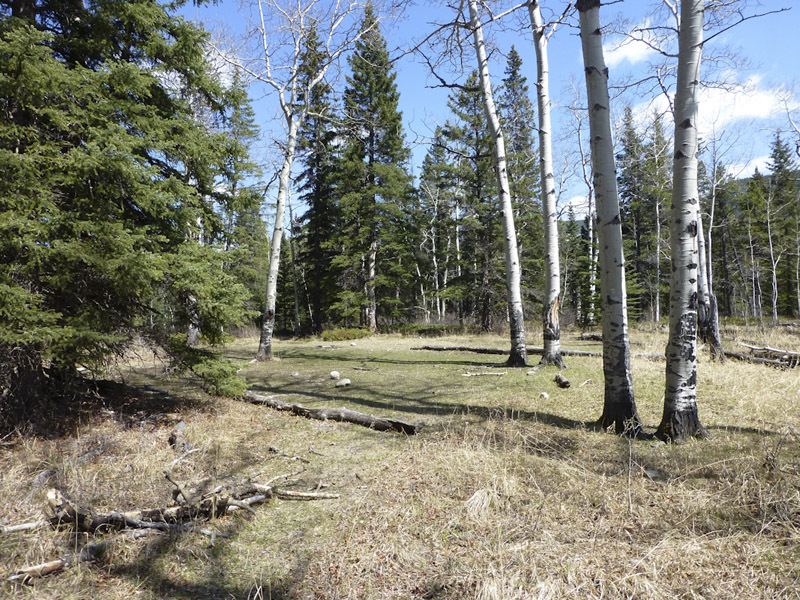 I’m referring to the section of park bounded by the Trans-Canada Highway, Rafter Six Ranch Resort, Camp Chief Hector and Stoney trail, north of Barrier Lake. 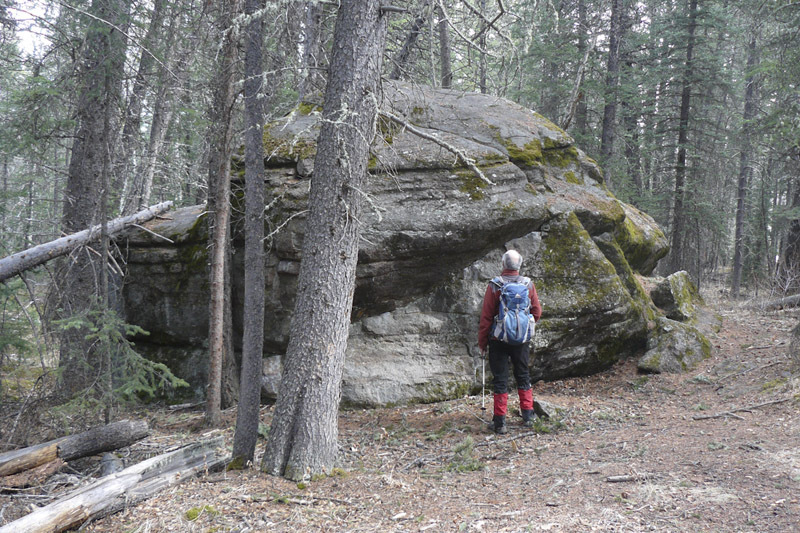 Unlike the popular northern section, it has no public facilities, but it does have a large network of trails. Rafter Six Ranch Resort uses them for trail rides, Camp Chief Hector for hiking and orienteering. 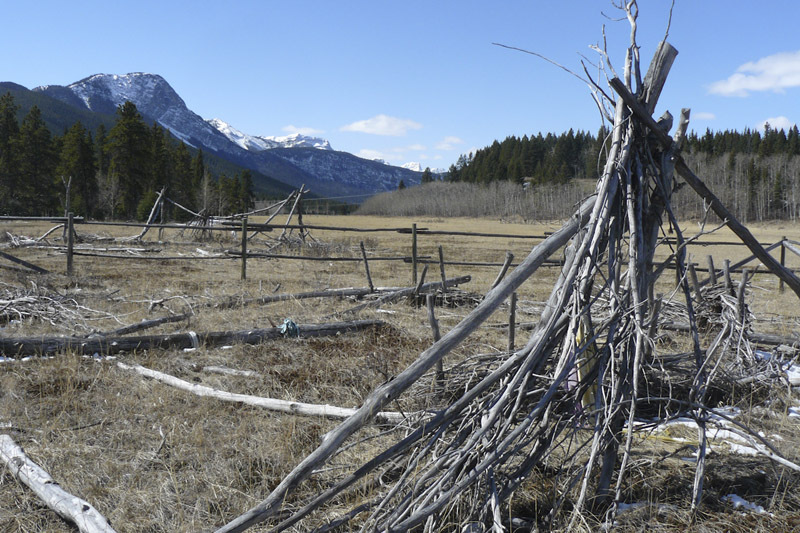 The official parking lot for non-locals is nearly always empty, possibly because it is not promoted by Kananaskis Country or marked on any map. To get there start from intersection #114 on the Trans-Canada and follow signs for Rafter Six Ranch Resort and YMCA Chief Camp Hector. At the T-junction go straight into an unidentified parking lot lined with boulders. The main trail into the area starts here and is the northerly start to Stoney trail, aka the original Hwy. 40. 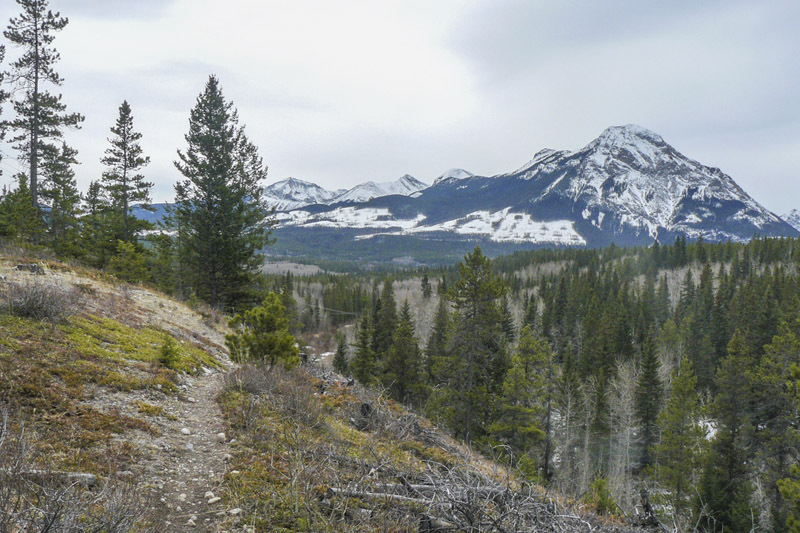 At one time you could drive to Soapy Smith trailhead 1.7 km from the start of the trail network, but must now walk or bike the initial flat on a track growing grass. 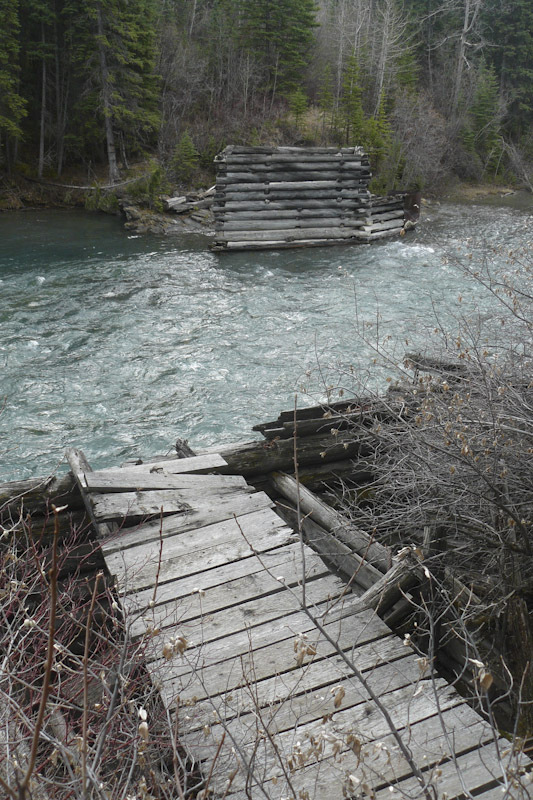 A much closer access to the trail network is Rafter Six which welcomes day guests with arms wide open. Why not combine a hike with Sunday brunch, lunch, dinner and a beer in the bar? Brunch and dinners must be booked in advance. Access is unrestricted between Rafter Six land and the park; just close the gates. Not so with the YMCA which posts “no entry permitted” signs at every gap in the fence. We have been coming here for a long time, in snowy winters of yore actually skiing the trails. 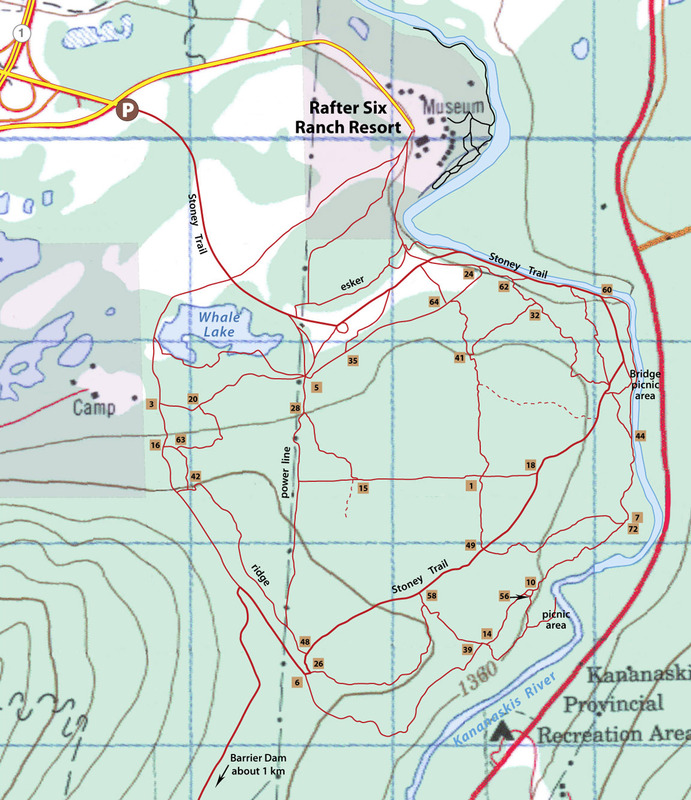 Hard to believe that ski trail maps were once produced by both Rafter Six and Camp Chief Hector! Nowadays, nobody skis the trails, but the more sheltered trails could very well be used for snowshoeing as we found out the hard way in March. (Perhaps this is something that Rafter Six could promote?) We now come mostly in Spring when the vegetation is greeening up, yet snow still plasters the Front Ranges. The trails are great for conditioning hikes ranging from an hour to all day. 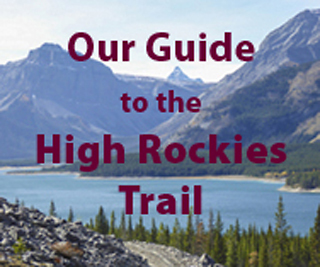 Besides the main thoroughfare of Stoney trail, which I try to avoid as much as possible, there is a network of single-track trails that wind through open forest, along eskers and through hilly knob and kettle country. There are no lakes other than Whale Lake with its Marilyn Monroe connection (see the forthcoming volume 3 of the trail guide). 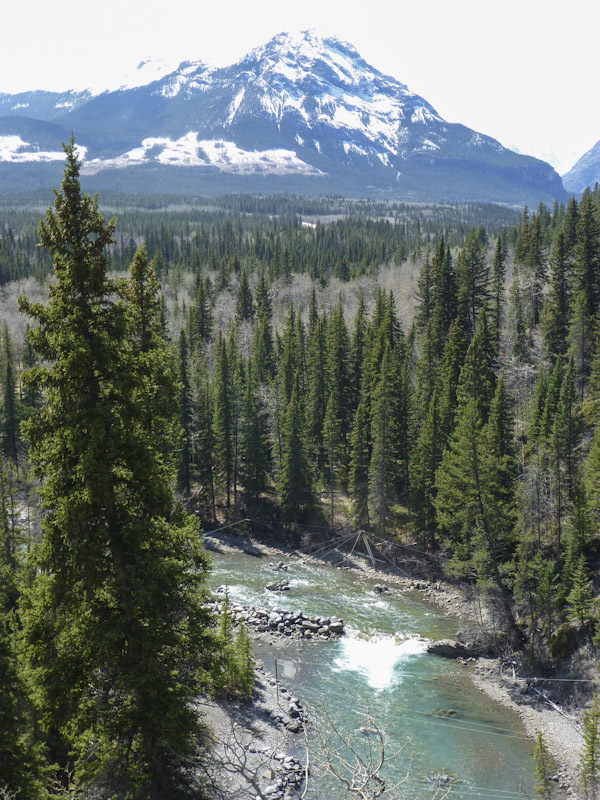 My favourite trails are the ones that edge along the bank top of the Kananaskis River. From high vantage points you look way down to the kayak course in Shaugnessy Canyon. There’s also a trail down to the river at this point. But enough. In the book ’ll suggest a few loops, but in the meantime have fun concocting your own. 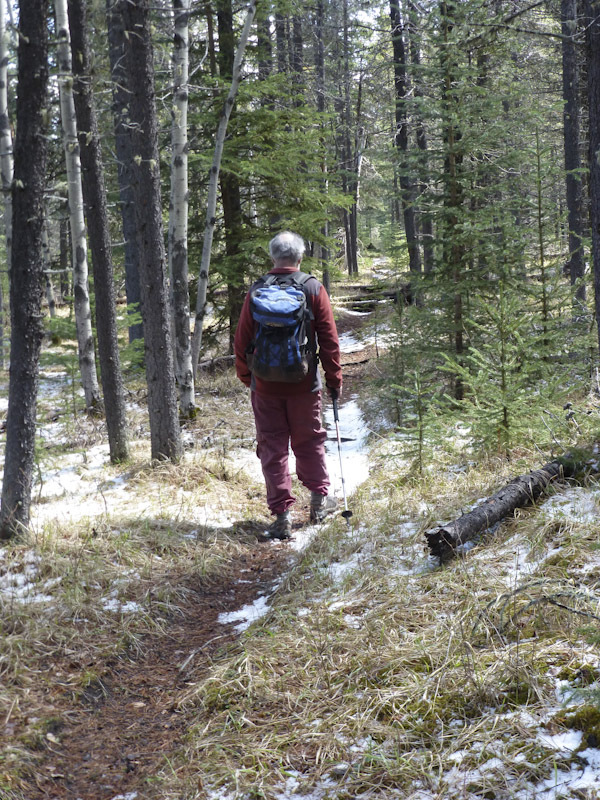 Recently Barry Taylor (Hiking with Barry) described a walk around Whale Lake. 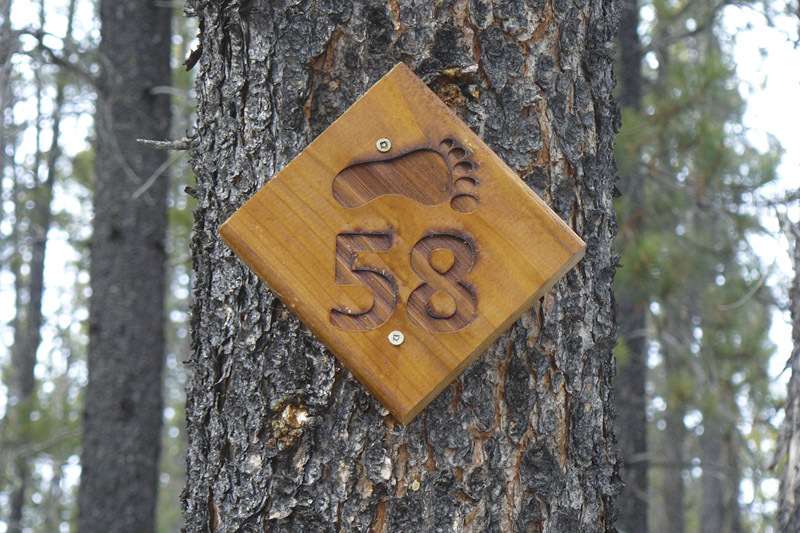 The trails, while not official Kananaskis Country trails, have been marked at junctions with small numbered wood signs nailed to trees. So enviromentally friendly are the signs, you can spend ten minutes looking for one. To save you the trouble we have put some of the numbers on the accompanying sketch map. If you can fathom out the numbering system let me know. Click on map for larger, printable version. Next: Need Help Growing Wildflowers in your Garden?